The U.S. refugee resettlement program is the world's largest, accepting two-thirds of the 98,000 refugees who were permanently resettled in 2013. Because of the scale of the program and the growing diversity of resettled refugees, service providers face an increasing range of challenges. 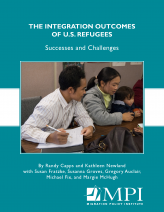 To better understand these challenges, this report analyzed previously non-public State Department admissions data to gain insight into the characteristics of arriving refugees, including native-language proficiency and education. The report also draws on U.S. Census Bureau data to assess refugees' integration outcomes, finding that their income levels and rates of public benefits usage approximate those of the U.S. born with longer residence in the United States. These findings underscore that most refugees become self-supporting over time—a core goal of the U.S. resettlement program. The report also highlights and analyzes a number of challenges that the U.S. resettlement program faces based on characteristics of arriving refugees, finding that certain groups arrive with particularly low English language skills and education levels. The authors suggest that basic support for employment, education, and language services for refugees might be insufficient to meet the greater needs of these increasingly diverse groups. This report aims to inform the public debate about U.S. refugee resettlement. It suggests that policymakers consider improving refugees’ access to mainstream education and job training programs, as well as increase long-term integration prospects with a greater focus on predeparture programs for refugees who often spend years in camps awaiting resettlement. On a broader level, it emphasizes the importance of support for the U.S. resettlement program in the face of a surging number of refugees worldwide.